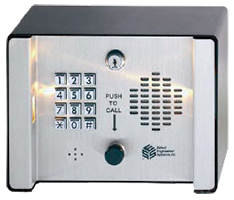 SG Series incorporates the latest technology in gate entry control to address both residential and commercial applications. 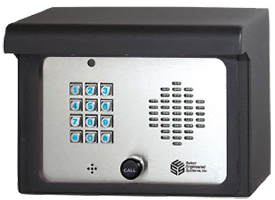 With both PIN access and Card or transmitter capability the SG Series provides 9 Time zones for access control and “Do Not Disturb” that provides the owner even more control. It has capacity to handle 100 PIN’s and cards or transmitters each programmable by time zone as well as function and can make them valid by date or permanent. These features make it easy to track the access of visitors, deliveries and contractors. With its event buffer feature, it is easy to track recent access events. The SG Series is DSL compatible without any additional equipment required. The SG3DMR and SG3DMRN incorporates the latest user-friendly Voice Message technology. With Voice messages for visitor, confirming call status and messages for prompting owner keypad programming. It also has a built in Select Pass RF receiver. The SG2C provides “dated and timed” cards and PIN’s for visitors, deliveries and contractors. 26 Bit Wiegand device input. 100 PIN Codes, that can be used for visitors / deliveries and timed by start and end date (364 days out). Also programmable by time zone and function. 100 Cards or Transmitters, that can be used for visitors or deliveries and timed by start and end date (364 days out). Also programmable by time zone and function. Entrance (for 1 hour, or indefinitely). “Do Not Disturb” (through time zones). 10 Additional Telephone numbers can be programmed, and called using the keypad. Local call waiting and transfer. Uses the existing phone line. Transparent to existing or new DSL service. 2 Form C relays standard. Postal lock input available (REX). Open keypad programmable for voice mail. RF Receiver, allows user to add and use RF transmitters to control gate or entrance. Wiegand Input Prox Card Reader. Select Pass Transmitters / Receivers. Long Range Proximity Cards and Reader. Flush Mount Ring (Factory installed). Residential with or without a pedestrian gate. Small Gated Community with less than 10 homes. Card access used for residents. Retirement homes / Convalescent homes. Visitors call supervisor’s desk. Card acess used for employees. Optional camera shows the visitor. Hospitals: Visitors use Push to Call to place call to security. Card access used for Doctors. Office buildings: Push to Call used by visitors to call receptionist. Employees use card access for entrance. Optional camera shows visitor. The Select Gate Designer Model III incorporates the latest user-friendly Voice Message technology making the SG3DMR very easy to own and operate. With Voice messages for visitor and messages for owner keypad operation and programming, the SG3DMR is more capable than ever before. Have DSL? No problem. The SG3DMR is also transparent to existing or new homeowner DSL lines. Built-in RF 26 Bit Wiegand device input. Voice message assist in programming mode. Voice feedback on invalid key entries. Voice message when house line busy. Ability to work with a PBX system. Local and remote latching (opening) of the entrances from 1- 99 seconds, 1 hour, or indefinitely. Large Event Log Buffer (approx. 800). Postal lock inputs available (REX). Select Gate Software Package provided with SG3DMR for remote programming and retrieving the event log buffer. Wiegand Input HID Card Reader. Pedestals – 36”, 42” or 48”. Camera, internal Color or Black and White. Small gated community with 10 homes or less. Card access used for residents. Retirement homes / Convalescent homes. Visitors use Push to Call to supervisors desk. Card access used for employees. Optional camera shows the visitor. Small Factories or Companies: (Push to Call used by visitors to call receptionist). Employees use card access for entrance. Optional camera shows visitor.